I remember my first date with rif. We were a few months short of turning 16, with no car and barely any money. He took me to Restaurant Darul Ehsan (no longer in operation) after our tuition class, and ordered two plates of maggi mee goreng kosong with a sunny side up. 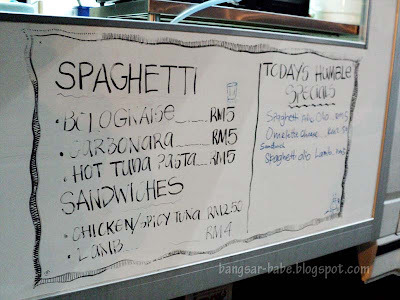 Back then, a plate of maggi mee goreng was RM2, and an extra egg was RM0.50. Our date cost him less than RM10, but we were happy. When he started working, he bought me nicer things and better food. I love how he pampers me and I love going to nice places to eat, but a small part of me wants to relive the old days. 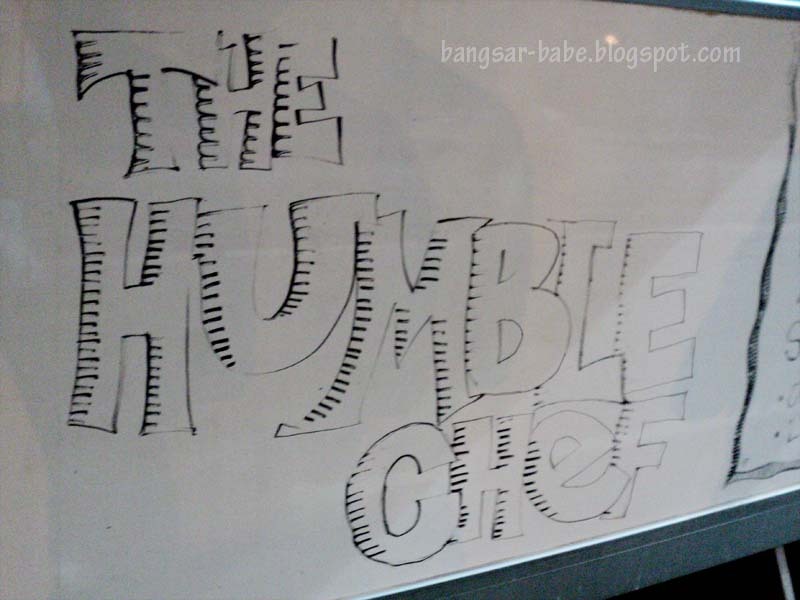 On the way home from an event, we made a random discovery in the form of The Humble Chef at Pusat Bandar Damansara. I’ve seen this van operating at the side of the road across McDonalds for a few months, and I finally tried it last weekend. 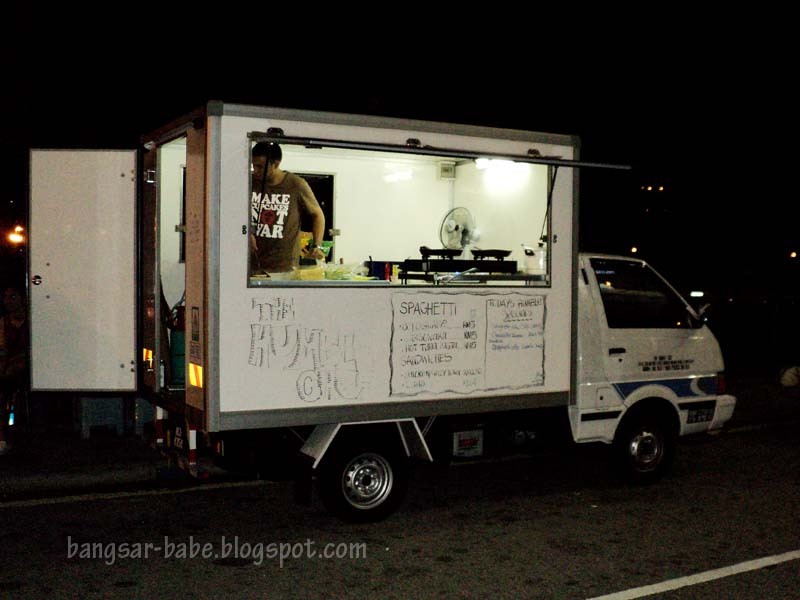 At half past midnight, business was brisk, with all six tables along the roadside occupied. From our table, we could see the highway and cars passing by in the middle of the night. Incredibly romantic, I must say. It felt as though we were back to when we started dating. I was never really the candlelight dining kind of girl. Until today, I don’t think I am. The prices were very reasonable. 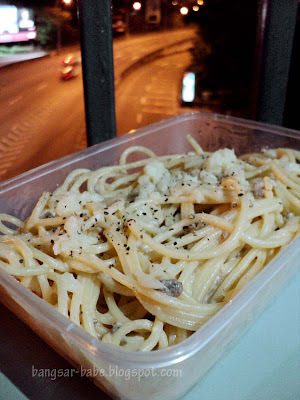 rif and I shared a Spaghetti Olio Lamb (RM5), Carbonara (RM5) and a lamb pita (RM4). 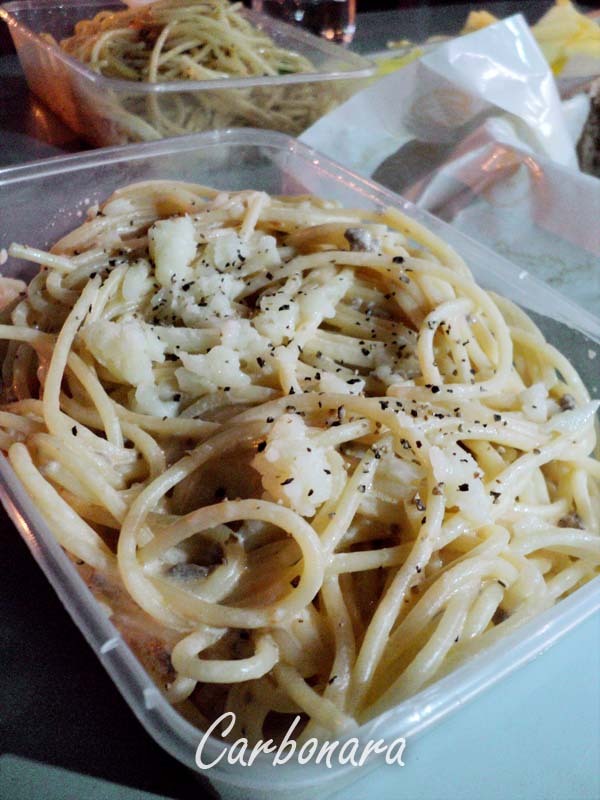 Where else can you find pasta for RM5? When I saw the price on the blurry signboard, I thought I saw wrongly. “Was it RM15 or RM5?” I asked the friendly owner, Rosman. It was RM5, I kid you not. Rosman is a western and pastry chef who worked in a few restaurants in Germany, before opening The Humble Chef. 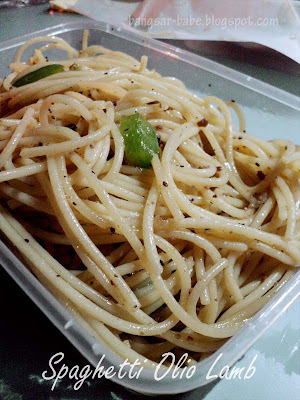 Spaghetti Olio Lamb was simple, with robust flavours from the olive oil, garlic and herbs. The lamb bits gave the pasta a meaty texture and a more intense flavour. It may not taste like the RM30 versions from restaurants, but this carbonara was decent, with melted cheese on top. I liked how generous they were with the cream sauce, but I would have preferred some mushroom slices in it. However, for such an affordable pricetag, I’ll let that slip. The lamb pita knocked my socks off. 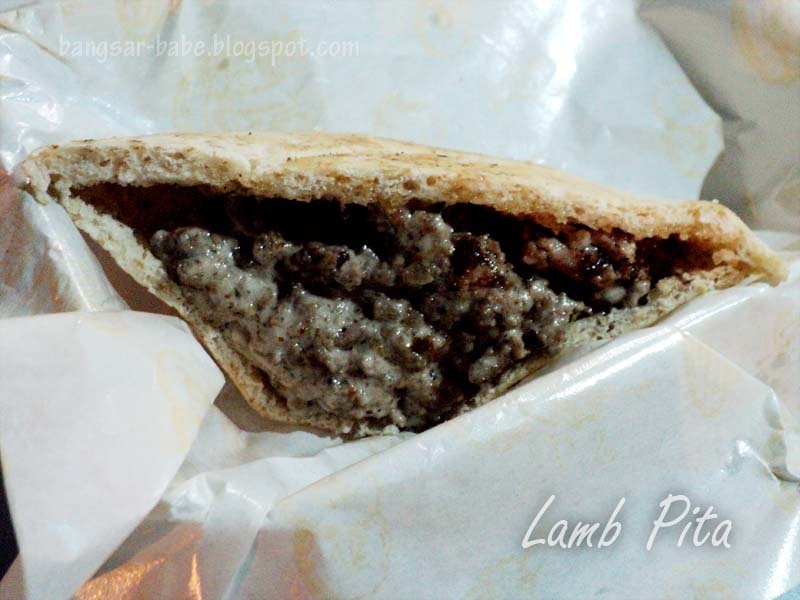 There was a lot of minced lamb in the pita pocket. I refused to let rif have more than 2 bites so he ordered another chicken pita (RM2.50). This was also very good, with plenty of shredded chicken and cheese. But between the two pitas, I would go for the lamb. 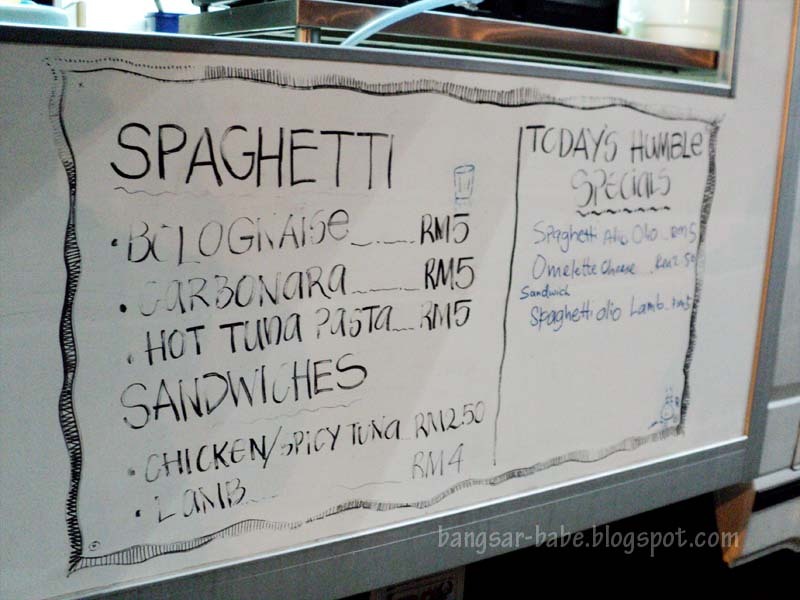 They have special dishes such as chicken chop, lamb chop and lamb meatballs, only on Mondays, Tuesdays and Wednesdays (it’s best to call and confirm). As weird as it sounds, I liked that the food wasn’t 5-star quality and that I ate at the side of the road in my party dress. I was happy, satisfied with my food and delighted over the prices. Verdict: Good comfort food. I’m definitely coming back for more. Well, a stall like this with such food, consider itself quite good. Some places even worst! Correct or not? agreed on the ambiance part, very ze lomantik! Such cheap prices! definitely worth a visit even just out of curiousity. 🙂 And will take note on the lamb kebab. It sure does look STUFFED! Wah, amazingly cheap. Humble indeed. I certainly don't mind pigging out here, for RM10 can get me a lot liao. nice… its not always about the food.. its also about the company.. too much of good food makes one miss the simple pleasures of life..
Awww.. nothing like visiting the roots, where the Big Romance all started! Sounds like the perfect date! wah this is so romantic. relighting the old memories! I like! Oh my goodness. This place was right under my nose all this time and I didn't know of it's existence! What's their opening hours like? Jo – They open from 9pm till 1am. Call to double check. J – Ya lor…you can literally walk across and get your fix! Tummy Rumble – Yup…I love basic food. J2Kfm – Come we go! Cumi & Ciki – Very ang moh! 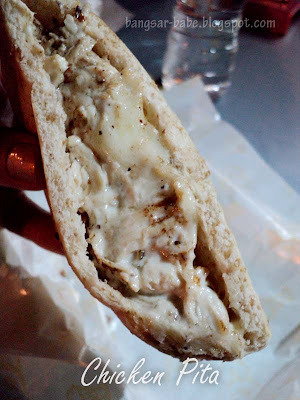 iamthewitch – Ya…super stuffed pita. Sean – Hahaha…now that you mentioned it, so true! Wilson & Rachel – Yup yup! FNCH – Do you know where the old HELP university is? It's just there. Here's a map for you. Hi, just one point, if you start adding mushrooms to carbonara, it stops being carbonara. Haven’t tried this place yet but going to soon. I recently went back. Quality has dropped, unfortunately. 🙁 When I first found them, they were all about giving customers good and value for money food. Now, fame has gotten to them and the portions are ridiculously small. Do keep this in mind if you visit them.